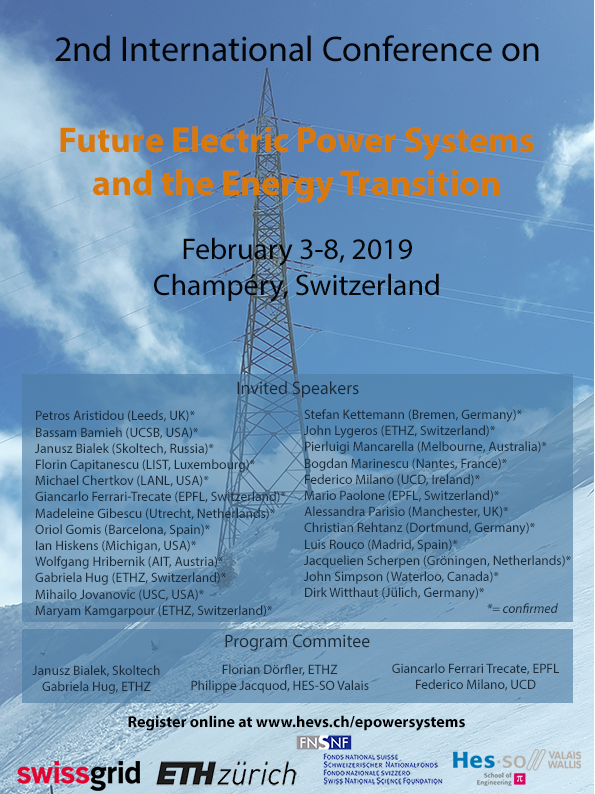 2nd International Conference on "Future Electric Power Systems and the Energy Transition"
to be held in the beautiful ski resort of Champéry, Switzerland, February 3-8 2019. This event follows a very successful one that took place in 2017. This conference is organized by the School of Engineering of Valais and the ETH Zürich Automatic Control Laboratory, in partnership with Swissgrid. World renowned experts in electric power systems will gather to identify and discuss current and future challenges, as well as opportunities facing electric power systems from production to consumption, via transmission and distribution of electricity, in the light of the energy transition. For more information about the conference, please follow this link.